80% of organisations like yours are achieving an ROI in 12 months or less by significantly decreasing approval process times, reducing paper handling costs and time for scanning, copying and painful routing. Many processes require digital signature integration, for approvals, document signing and to manage the authenticity and integrity of documents. In the past, the challenge was to smoothly integrate digital signatures with business process workflows without requiring custom software development. 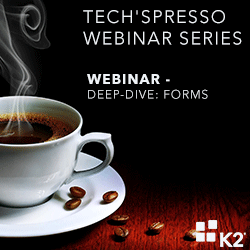 Register to see the on-demand recording to hear how K2 has partnered with DocuSign, the leading digital signature supplier, to seamlessly integrate DocuSign digital signatures with K2 workflows and SmartForms. •Understand how the K2 and DocuSign out of the box integration works.